It’s bitter sweet every time I talk about my passion for running and people always say, “You actually like that?” Yes, I do. I love it. Running actually helps clear my mind of all the busy things going on in my life and is an awesome past time. But, besides being a runner I’m also a student. I attend a competitive high school where the classes are vigorous, and the teachers are strict. But, besides being a runner and a student, I’m also a son. I live under my parents’ roof and at home, whatever they say, goes. I have strict parents that have high expectations of me. Home isn’t complete relaxation though. At home I face a lot of chores and do a lot of work. It definitely isn’t easy to balance all the busy things that go on in my life so every hour counts. It requires a precise schedule that must be on time. 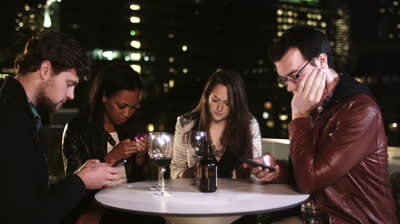 It happens quite often when I sit with a group of friends, hanging out…but we aren’t really hanging out.. We’re all looking at the screens on our phone. It happened to me once where it was with my cross country team and all we did was sat their staring at our video, or game, etc. I personally don’t like it once I come to the realization of it but I too am guilty of it. It’s at those times where I think to myself, “What has come of this generation?.. What are we doing just sitting here, on our phones, and not having an actual conversation?” That’s when I make my attempt at trying to break the silence. Jokes and riddles are a great way to get people to stop looking at their phone. When you ask them a question it gets them involved to what you’re saying and think about an answer. They get a laugh out of it, and everyone enjoys. Often times when you start off with a joke, your friends start telling their jokes and a solid conversation is going. Q: Before Mt. Everest was discovered, what was the tallest mountain in the world. Q: A: Most people will only see three F’s. But, there are actually 6!! Here’s a hint, check the word “oF.” Don’t worry, it caught me to and I almost flipped out. If you can’t stay off your phone at least use it WITH the group. Do something together like watch a video. If you’ve seen any funny videos or videos that you like, share it with the group. If it’s funny you’ll all get a laugh out of it. My favorite funny video is on the Youtube channel about this soccer play. It left me in complete tears because it was so ridiculous. Another way to utilize your phone in group hangouts if you really can’t stay off it is play an app game. There are a lot of trivia games that can be more fun than you think. It involves the group and brings excitement when the answer is revealed. Also, you can play games like Truth or Dare, or 21 Questions, that involve the entire group. Here are just some of the many fun activities that you can do to be an icebreaker in a group hangout. I know these awkward moments happen very often for everyone and I hope just these few methods can go a long way. 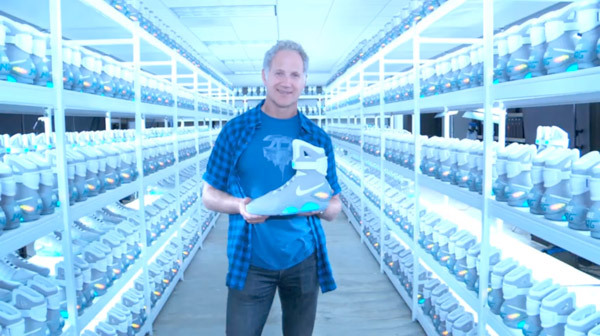 Nike Air Mag Finally in 2015?!?! In the 1989 movie, Back to The Future Part 2, Marty McFly (Michael J. Fox) is seen wearing these futuristic Nike shoes that light up and even self tie themselves. 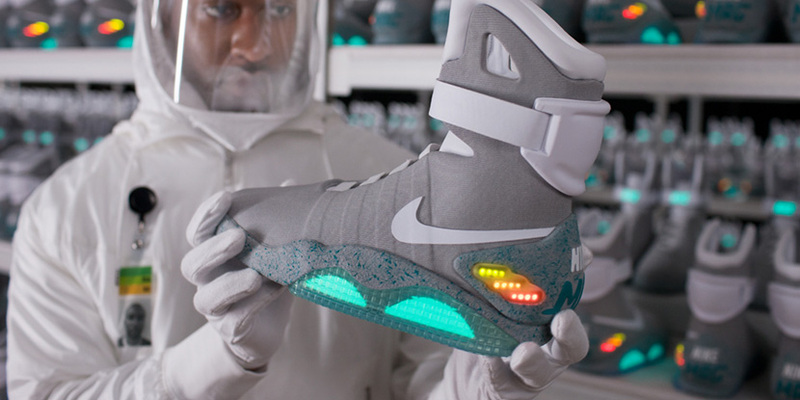 The comedy/sci-fi movie was released in 1989 but the story was set in 2015, which was the future from where the Nike Air Mag would come from. Fast forward 26 years and here we are, 2015. 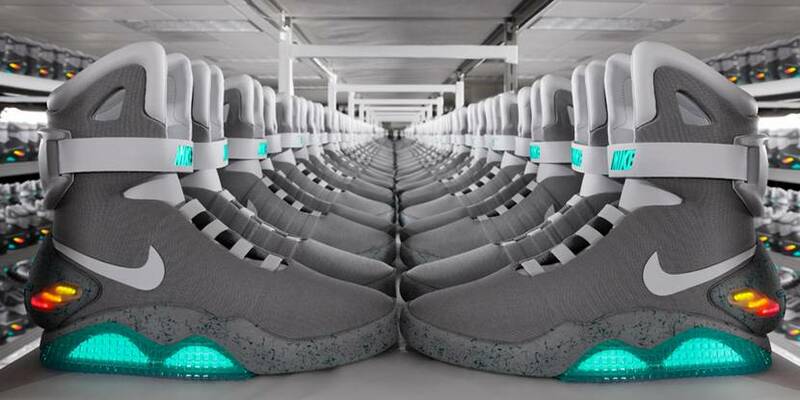 But, where are these futuristic, self tying Nike shoes that Back to The Future claims there to be? Indeed they are here and have been here since 2011 when the Back to The Future Nike Air Mag replicas were released. They were almost completely accurate to the ones displayed in the movie with only one thing missing; the self tying function. There were 1500 pairs made and they were auctioned on ebay where the proceeds would go towards the Michael J. Fox Foundation for Parkinson’s Disease Research. Even though these official Nike replicas were very aesthetically appealing, they did not have that iconic self tying function that made the shoes popular. 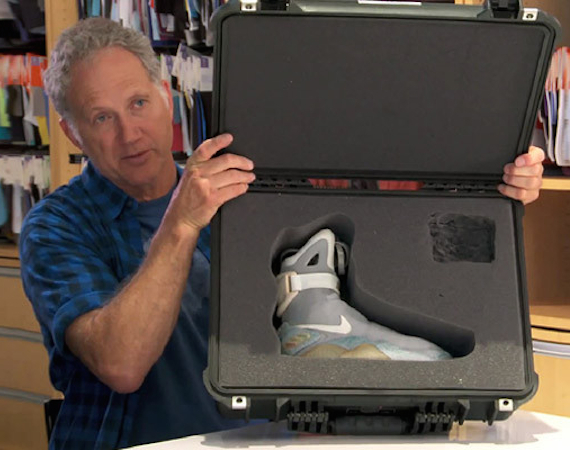 Well, WORRY NO FURTHER YOU SNEAKERHEAD, BACK TO THE FUTURE FANS. They’re coming and 2015 is the year where they were in the movie so 2015 is when they shall be delivered!! Although these shoes look very cool with the lights, and futuristic mold, who would actually wear these? Especially after paying hundreds of dollars for it you wouldn’t want a blemish on these treasures. Plus, you’d look like some freak alien with them. Although, you would attract tons of attention and definitely turn heads. Many buy these for display purposes and don’t actually wear them. Some fans even get angry when people wear these shoes. They treat them as if they are artifacts and shouldn’t be touched. I for one am very excited for the release of the new 2015 Nike Air Mags. Even though it is highly unlikely that I will ever attain one, I’m excited for the power lace technology. Hopefully with the innovative self tying function already established, Nike will incorporate this cool feature into future shoes. Yes, I’m a guy and I read this book. And I also watched the movie. And I thoroughly enjoyed it. Go ahead- throw your stereotypes at me and make fun of me. I don’t care. 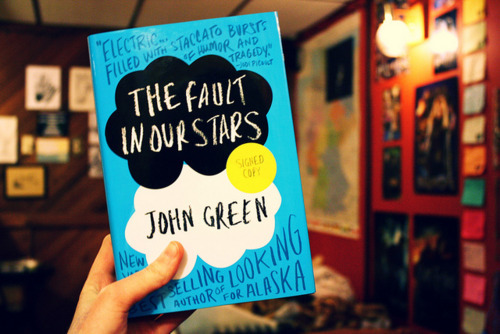 Call me a girl but I for one, enjoyed both the movie and the book. The book was also written by a guy, not a girl.